You said you were familiar with the game,” The Duke said to Calista, as with a slight bow he allowed her to pass before him. “I’ve grasped the rules,” she said. He took a billiards cue from a rack by the door. His fingers brushed against hers as he gave it to her. She forced herself not to jump. Instead, she let her own fingers slide over the tips of his long fingers in reply. “Shall we form teams?” Darius asked brusquely. “The gentlemen against the ladies?” Herbert suggested. “Surely it’s the aristocrats against the actresses,” Calista put in. She felt rather than saw Darius’s sharp glance at her. “Would that suit you, Calista?” he asked. 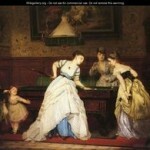 It was a surprise to me (and maybe to you too) that women played billiards in Victorian times. There was a great deal of female popularity for the sport, as both participants and spectators, as these wonderful old paintings reveal. I’ve been collecting them on Pinterest. 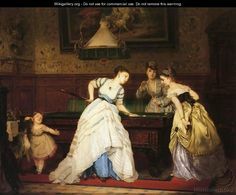 Take a look: Billiards, Ladies? Playing the Duke’s Mistress released in May 2016 – I do hope you enjoy playing with Calista and the Duke! Now available on Amazon.